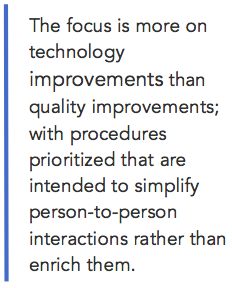 Quality improvement measures are intended to provide standardization across the gamut. A case can be made that they have been simplified to procedural processes and, despite their title, may not adequately or accurately regulate patient-centered quality care.1 We explore the concept of moving more strongly in the direction of a patient-centered orientation in our blog titled “A New Way of Thinking About Quality Improvement in Healthcare”. Because we live in a world where claims can be deceiving and fact-checking is imperative, let’s unpack the complicated details of how the US healthcare system’s well-intentioned quality measures may be missing the mark in their execution. Moreover, quality measures have become inconsistent and often incomprehensible due to sheer numbers and varied focus.6 Rather than contributing to clinical meaningfulness, procedure and internal decisions are influenced by external reports that drive consumers and finances.7 We’re forced to consider whether current quality improvements enrich person-to-person interactions, or merely simplify them to a robotic, rote process. Healthcare value is based on a relationship between quality and cost. Not only is the US ratio disproportionate, we spend more money on healthcare and have more health care disadvantage relative to all other high-income countries.8 The measures used to determine quality are not reflective of what matters most to patients. For example, the Quality Payment Program (QPP)9 is one incentive program that is, again, allegedly a step in the right direction but falls short when it comes to meaningful quality measures.By its own proclamation: “The Quality Payment Program improves Medicare by helping you focus on care quality and the one thing that matters most — making patients healthier.” Ostensibly, this is a noble cause. With a bit of digging though, we see that the “quality” requirements for clinicians to meet their scores and qualify for payment are one-dimensional. Due to standardized procedures, sometimes our quest to meet measures causes clinicians to provide less than ideal care. They end up abandoning an approach that would prioritize the individual and circumstantial needs of patients because the procedures created to meet these standards require a blanket approach to all patients that fall within specific characteristics, circumstances, and categories. 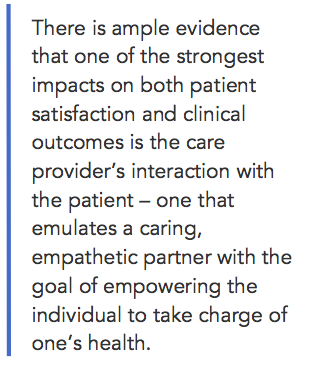 There is ample evidence that one of the strongest impacts on both patient satisfaction and clinical outcomes is the care provider’s interaction with the patient – one that emulates a caring, empathetic partner with the goal of empowering the individual to take charge of one’s health.15-17 And yet our current quality improvement measures do not effectively support such an approach. Whether you ultimately choose to act through informing yourself or colleagues, sharing resources with stakeholders, or expressing your opinions and experiences with decision-makers, your efforts can make a difference. 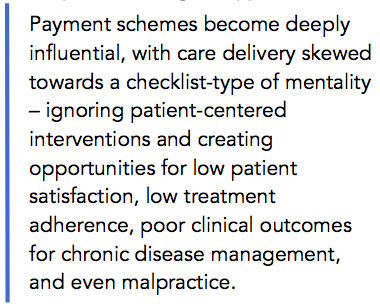 With healthcare payment reform on the horizon, we must not miss the opportunity to ensure that future measures are blended with best practice gleaned from behavior change science. We must first redefine our characterization of “quality” to incorporate meaningful outcomes along with measurable standards. There are essential aspects of patient-centered care that should inform healthcare delivery and the prioritization of value. Ideally, the next stage of quality metrics will represent a patient-centered skill set and be aligned with values like collaboration, empathy, and support for autonomy. In the meantime, in our next blog article, we suggest ways to meet current quality standards while remaining patient-centered. 1. Blumenthal D, McGinnis M. Measuring Vital Signs: An IOM Report on Core Metrics for Health and Health Care Progress. JAMA Intern Med 2015;19;313(19):1901–2. 5. Goldzweig CL, Orshansky G, Paige NM, et al. Electronic Patient Portals: Evidence on Health Outcomes, Satisfaction, Efficiency, and Attitudes: A Systematic Review. Ann Int Med 2013;159(10):677-687. 6. Blumenthal D, McGinnis JM. Measuring Vital Signs: An IOM Report On Core Metrics For Health and Health Care Progress. JAMA Intern Med 2015;313:1901–2. 7. Lindenauer PK, Lagu T, Ross JS, Pekow PS, Shatz A, Hannon N, et al. Attitudes of Hospital Leaders Toward Publicly Reported Measures of Health Care Quality. JAMA Intern Med 2014;174:1904–11. 8. Woolf SH, Aron LY. The US Health Disadvantage Relative to Other High-Income Countries: Findings From a National Research Council/Institute of Medicine report. JAMA Intern Med 2013;309:771–772. 11. Saver BG, Martin SA, Adler RN, Candib LM, Deligiannidis KE, Golding J, et al. Care that Matters: Quality Measurement and Health Care. PLOS Med 2015;12(11): e1001902. 14. Welch HG, Passow HJ. 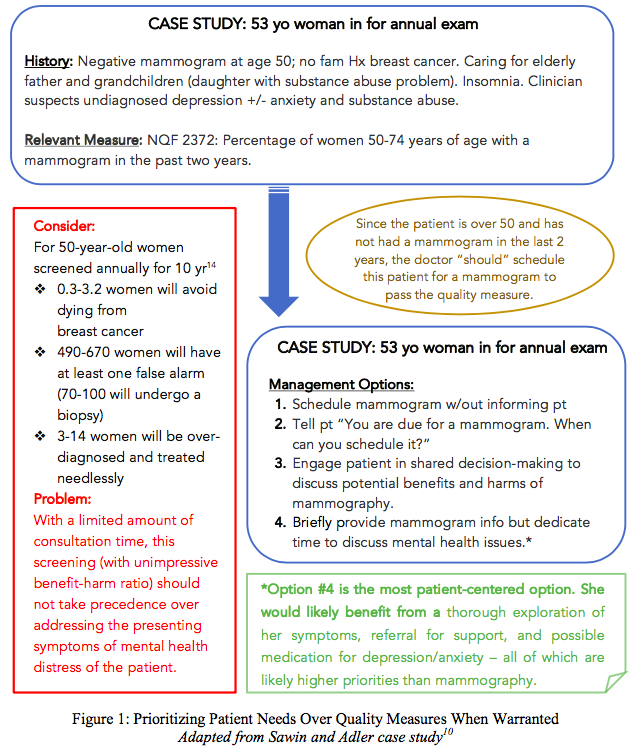 Quantifying the Benefits and Harms of Screening Mammography. JAMA Intern Med 2014;174(3):448-454. 16. Manary MP, Boulding W, Staelin R, Glickman SW. The Patient Experience and Health Outcomes. N Engl J Med 2013;368:201-203. 17. Johnson DM, Russell RS. SEM of Service Quality to Predict Overall Patient Satisfaction in Medical Clinics: A Case Study. Qual Manag J 2015;22(4):18–36.